Downy mildew is a common fungus in most lettuce growing regions, especially during cool, moist weather. Spores can be blown long distances. Under favorable conditions, downy mildew is a very explosive disease, capable of appearing at high incidence in a field overnight. When spores land on lettuce foliage, they germinate and can penetrate the lettuce leaf within three hours. Lettuce is susceptible at all growth stages to the downy mildew pathogen. Following penetration and establishment in the leaf, fruiting stalks grow through the leaves and branch repeatedly producing several spores on each tip, resulting in a whitish mat of millions of spores on each plant. Affected tissues turn brown. The fungus can penetrate to leaves internal to the wrapper leaves. Relatively low levels of infection can downgrade a crop, cause significant trimming losses at harvest and promote decay by bacterial organisms during postharvest transport and storage. During transit, lesions become soft and slimy as secondary decay organisms gain entrance through the tissues infected with the downy mildew fungus. High levels of disease can render a crop unmarketable. 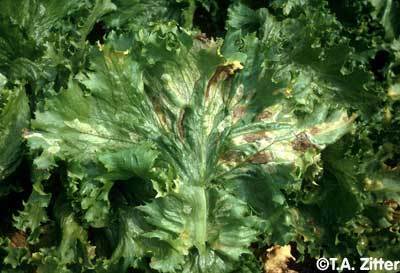 “Incited by the obligate parasite Bremia lactucae, downy mildew is one of the most devastating diseases of lettuce worldwide. Attempts to manage this fungal disease using host-plant resistance have frequently failed due to the development of new races of the pathogen. Therefore, chemical control is of the utmost importance in humid areas where environmental conditions are very favorable for disease development. Since the year 2000, a number of new fungicides targeting the Oomycetes, the class of fungi to which downy mildew belongs, have come to the market or are being considered for registration. It was the objective of these studies to investigate a select number of these for potential use in Florida for lettuce downy mildew control. Authors: Raid, R. N., and D. D. Sui. Affiliation: University of Florida, IFAS, Everglades Research and Education Center. Title: Management of lettuce downy mildew with fungicides. Source: Proc. Fla. State Hort. Soc. 2012. 125:218-221. This entry was posted in Fungicides and tagged downy mildew, environmetal conditions, fungicides, fungus, lettuce, spores by pesticide guy. Bookmark the permalink.